McWane and its affiliates, divisions, facilities, and subsidiaries (collectively “McWane”) value and respect your privacy. This Privacy Statement describes the information McWane collects about you through its websites, how McWane uses this information, and other pertinent information related to your online interactions with McWane. McWane, Inc. is the controller for all of these websites and applications. By interacting with any of these websites or applications, you are accepting the terms of this Privacy Statement. If you do not accept the terms of this Privacy Statement, do not use McWane’s websites or applications. 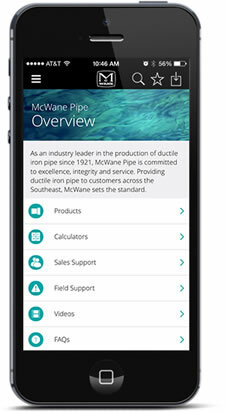 McWane collects information you provide directly through its websites and applications. McWane also collects information through automated means. Both mechanisms are described in more detail below. Some McWane website and application functions request or require you to provide information to McWane. Required categories of information for these functions are marked with an asterisk. Declining to provide the required categories of information may limit your ability to interact with McWane through its websites and applications. Requests, Questions, and Comments – McWane asks for certain information when you choose to make requests, ask questions, or submit comments using the forms on its websites and applications. When submitting your requests, questions, or comments, these forms may require you to enter information such as your name, address or geographic region, phone number, fax number, email address, company name, and company website. When submitting support requests through McWane’s applications, you also have the option to include photos. Whitepapers and E-Books – McWane asks you to provide information such as your name, email address, and company name, in order to download certain whitepapers and e-books from some of its websites. Forums – McWane asks for your date of birth, email, company name, and geographic region when you sign up to participate in its online forums. Job Applications – McWane requires you to provide your name, email address, phone number and address when you apply for a job through McWane’s websites. You may also choose to submit additional information such as a resume. Creating online profiles – If you wish to create an online account or profile with McWane to access certain features or portals, you will be asked to provide personal information such as your name, telephone number, address, email address, country, and company name. McWane uses the information you provide only consistent with your relationship with McWane and the practices described in this Privacy Statement in order to respond to your requests, questions, comments, or support needs; to provide you with reference materials and information that may be of interest to you; to allow you to participate in our online forums; to process your job application(s), to understand how visitors are interacting with McWane’s websites and applications, and to provide you with information about McWane’s products or services that may be of interest to you. McWane does not intentionally collect or store sensitive information about you. Please do not submit sensitive information to McWane through its websites or applications. McWane’s websites and applications collects certain information by automated means, such as how many users visit, the pages visited, the searches conducted, or the number of downloads of McWane materials. By collecting this information, McWane learns how to best tailor its websites and applications to its visitors. McWane collects this information as explained below. When you visit McWane’s website, the IP address of the device you use to connect to the internet is automatically recorded in server logs located in the United States. McWane connects your IP address to the information you submit when creating a profile or registering to use one of its forums. McWane does not connect IP addresses to other personal information, except as necessary to investigate illegal conduct or any unreasonable conduct in connection with the use of its websites, to comply with legal process, and to assist law enforcement with subpoenas. McWane uses third party service providers to operate some of its websites’ functions. For instance, McWane’s career application platform is operated by a third party, iCIMS; vBulletin hosts McWane’s forums; translations.com translates McWane’s websites into foreign languages; and Wistia and YouTube host McWane’s online videos. These third party service providers often have access to the information McWane collects from you and McWane does not control the privacy practices of these entities. McWane encourages you to review the privacy statements of these third parties to make sure you understand the information that may be collected, used, and shared by them when you use these functions on McWane’s website. In addition, McWane may disclose information about you to third parties where it has a legitimate purpose for doing so, including: (i) if it is required to do so by law or pursuant to legal process, (ii) in response to a request from law enforcement authorities or other government officials, or (iii) when it believes disclosure is necessary or appropriate to prevent physical harm or financial loss or in connection with an investigation of suspected or actual illegal activity. McWane may also provide links to third party social media websites that enable you to share information with your social networks and to interact with McWane on platforms not controlled by McWane. Your use of these third party websites may result in the collection or sharing of information about you. McWane encourages you to review the privacy statements and settings on the social media websites with which you interact to make sure you understand the information that may be collected, used, and shared by those websites. McWane also provides links to third party websites such as the websites of its distributors, websites which it thinks may serve as useful resources, or websites advertising events that may be of interest to you. These third party websites are not affiliated with McWane and your use of these third party websites may result in the collection or sharing of information about you. Please review the privacy statements of these third party websites to make sure you understand the information that may be collected, used, and shared by them. McWane uses reasonable administrative, technical and physical safeguards to protect personal information collected through its website. McWane has its headquarters in the United States and information McWane collects from you will be processed in the United States and the regions where McWane and the third parties described above conduct business. EU residents: The United States has not received a finding of “adequacy” from the European Union under Article 45 of the GDPR. McWane relies on derogations for specific situations set forth in Article 49 of the GDPR in order to transfer your personal information across international borders. In particular, McWane collects and transfers to the U.S. personal information only: (i) with your consent; (ii) to perform a contract with you; or (iii) to fulfill a compelling legitimate interest of McWane in a manner that does not outweigh your rights and freedoms. McWane retains your information for as long as needed: (i) to conduct business with you; (ii) as needed for the purposes outlined in this Privacy Statement or at the time of collection; (iii) as necessary to comply with McWane’s legal obligations, resolve disputes, and enforce any agreements. McWane does not target its websites and applications to children under the age of 13. McWane does allow individuals between the ages of 13 and 18 to participate in the Synapse online forum in compliance with the forum’s Terms and Rules and other applicable laws. McWane does not otherwise target its websites or mobile applications to children as defined by applicable law. If you believe your child has impermissibly provided McWane with their personal information, please contact McWane, so that it can identify and delete the information. To the extent required by law, McWane provides users with (i) reasonable access to the personal information collected through our website, and (ii) the ability to review, correct, export, and delete such personal information. Please contact McWane if you would like to exercise your individual rights and for information on any fee required to obtain copies of your personal information. EU Residents: You have the right to lodge a complaint with a supervisory authority if you believe that McWane has processed your information in a manner inconsistent with your privacy rights. McWane may update or change this Privacy Statement from time to time and, unless material changes substantially affecting your privacy rights are made, without prior notice to you. The top of this Privacy Statement will indicate when it was most recently updated.